This page provides some of the history of The Fine Spinners and Doublers’ Association Ltd during their existence in Bollington. 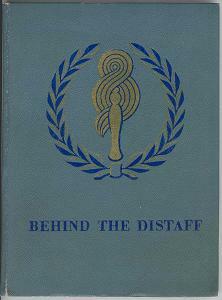 The details are taken from a book published by the company in 1946, Behind The Distaff. The Distaff is a staff or stick which holds the bunch of wool, cotton-wool or silk in spinning and an illustration of this became their corporate logo, pictured left. Quality has always been the foundation of Britain’s industrial pre-eminence in the markets of the world. British manufacturers will never lack customers as long as they stand united in their resolve to offer only goods of the highest quality. Fine words from the frontispiece of the book, but quality alone was not sufficient to keep the British cotton industry in business. Within 20 years of this being written almost the entire industry had gone – they discovered that in the modern world price was just as important a factor as quality, and others abroad could do an adequate job for very much less. The Fine Spinners and Doublers’ Association Ltd was formed in 1898. Difficulties in the cotton industry brought about the need to bring together those companies struggling to retain a place in the industry. They put together an enormous co-operative, a very early example of this, and ran the industry as though it were a single business with each participating company retaining its individual identity. On October 1st 1946 they changed their name to Fine Spinners and Doublers Limited. Throughout the remainder of this page we will refer to them as FSDA. Cotton is versatile, it may be spun into soft and downy fabrics, into smooth and hard-wearing canvas, and even into products sufficiently tough to wear down metal surfaces. It retains heat excellently, yet makes the coolest of fabrics suitable for summer wear. Cotton is nature’s whitest fibre. It does not deteriorate in storage or in service. It has a low rate of electrical conductivity. Its physical structure is such as to permit excellent capillary action, thereby absorbing and retaining dyes better than many other fibres. Cotton has the added advantage of its natural resistance to alkali, and this is the reason why cotton fabrics launder so well. Cotton can be processed so that it will recover from creasing, will not shrink, is water repellent, flameproof and mildew proof. In 1946 the company was made up of an amalgamation of 59 UK companies, four French, one Brazilian and one in the United States of America. Many of these companies had more than one mill in the co-operative – there were 107 spinning and doubling mills, a pilot production plant, a weaving mill, a mercerising plant, a large research establishment and a 39,000 acre cotton plantation in the Mississippi delta. George Swindells & Son Ltd of Bollington had both Clarence and Adelphi mills in the group, together with the Waterhouse mill of Thomas Oliver & Sons (Bollington) Ltd, and the research laboratories at Rock Bank, Bollington (now Rock Bank Rise). George Swindells & Son Limited had been in existence since the early 19thC with a mill, Clarence, in Bollington since 1830, and before that were operating in Stockport. They were almost unique in the world for in addition to spinning and doubling cotton they were ‘throwing’ silk, rayon and nylon. In 1856 they built Adelphi mill and between them the two Bollington mills were, in 1946, employing 1,000 operatives and had available 110,000 spinning spindles, 30,000 doubling spindles, and also a considerable number of spindles in the silk-throwing section. Thomas Oliver & Sons (Bollington) Limited was founded in c.1790. This first, small, mill powered by the waters of the river Dean developed over 150 years into one of the most important producers of Superfine Sea Island cotton yarns. For many years Oliver’s specialised in spinning and doubling the finest counts in the world. They actually produced 420’s gassed two-fold yarns. The Brussels lace shown in the picture was manufactured from this miraculously fine cotton yarn. It would be difficult to find any firm in the country where friendly relations and comradeship between employer and employee were stronger than at Oliver’s and Swindells. The companies’ books showed names which, like the Olivers and Swindells themselves, had a continuous record of service with the firm up to the fifth generation. No wonder Oliver’s adopted ‘Happy Valley’ as a trade mark. They were a happy crowd in ‘Happy Valley’, tremendously loyal to their own mill; immensely proud of the fine yarns they were spinning. For an interesting history of the cotton industry see Wikipedia . Beyond The Distaff is primarily a celebration of the company’s contribution to WWII. They manufactured an astonishing variety of cotton based products many of which were crucial to the winning of the war. These included the Bomber Dinghy, an inflatable rescue dinghy that saved countless lives, Desalting Apparatus – to turn sea water into drinking water, the Lindholm Apparatus which was five roped together canisters dropped from the air to airmen stranded far out to sea – the canisters contained a bigger dinghy and a variety of rescue equipment including cotton clothes and rations, the airborne cotton fabric covered Lifeboat – another rescue system, Floating Rope – much more useful than it may at first seem, Barrage Balloons – an extremely valuable air defence, a variety of cotton based Safety Suits – mainly for airmen, the Pneumatic ‘Duck’ (DUKW) – an inflatable craft for carrying troops across small waterways, inflatable aircraft Lifting Bags, Decoys of various kinds including tanks and artillery, and Parachutes also for use by airmen. Parachutes are the only ones in this long list that are known to have been manufactured in the Bollington mills. Cotton Counts: The number of pieces of thread, 840 yards in length needed to make up 1 lb in weight. 10 count cotton means that 10×840 yd weighs 1 lb. This is coarser than 40 count cotton where 40×840 yards are needed. In the United Kingdom, counts to 40s are coarse (Oldham Counts), 40 to 80s are medium counts, and above 80 is a fine count. 420’s noted above were the very finest being 420x840yd to the pound weight, that’s just over 200 miles in length! Gassing: The thread was passed through a flame to remove the sticking out fine fibres so making the thread smoother. 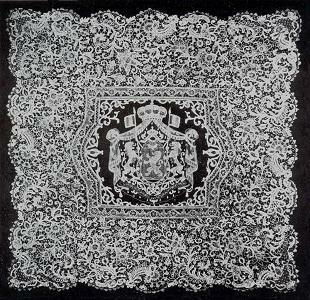 The lace example, pictured above, shows a piece of lace work produced from the finest thread that could be produced from Waterhouse mill, possibly the finest ever made. The piece was made about 1840 by nuns of a Belgian convent from FSDA hand-spun yarns from finest quality Sea Island cotton grown on the West Indian Island of St Vincent. The yarn, 420/2 count, was spun by Messrs Thomas Oliver & Son (Bollington) Limited. It took seven days to spin 5lbs of this superfine yarn by hand, it being too frail to be spun mechanically. How long the nuns took to complete it is not known. In the centre will be seen the Belgian Royal Crest bearing the motto “L’Union fait La Force” in French and “Eendracht Maakt Macht” in Flemish which, translated, means “Union is Strength”. The lace measures approximately 24″ x 18″ and in 1946 was on exhibition in the United States. This piece of lace was a treasured heirloom of the Oliver family. Its whereabouts today is not known. It is interesting to note that Empress Eugenie’s wedding dress contained some Brussels Lace also made from this fine yarn spun by Oliver’s. Doña María Eugenia Ignacia Augustina de Palafox-Portocarrero de Guzmán y Kirkpatrick, 16th Countess of Teba and 15th Marquise of Ardales; 5 May 1826 – 11 July 1920), known as Eugénie de Montijo , was the last Empress consort of the French from 1853 to 1871 as the wife of Napoleon III , Emperor of the French.